Saturday night was a nice night to be out. After the blazing hot day where my car thermometer read a high of 97 degrees, it was nice to be out in shorts and a t-shirt in the cooling evening. Roger and I had talked about heading down to the Casbah for some local acts that are comprised of staff from the Casbah. 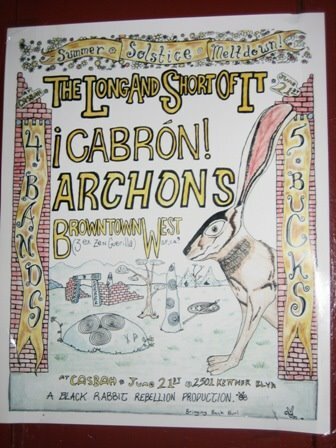 A great home-grown show featuring The Long and Short of It and the Archons… at least those are the two bands that we went to see of the four bands on the bill. I am not much for heavy metal but I do appreciate when music is done well. The Archons are heavy and loud (yes, the Casbah is already known for loud music). These guys are cranked to eleven. I noticed nearly everyone sinking in their earplugs for their set. Doom, the regular Casbah door guy is the front man for the band with wailing screams and deep riffs. The sound was weighted and pure. They truly have mastered the thick intensity that typifies heavy metal music. My ears are still ringing from the show. Next time I will bring my earplugs. Sadly, after working an event most of the day, I didn’t have the energy to stay for the Long and Short of It even though I love watching Ben perform. You never would think that he had it in him. A subdued bartender on most days, he pulls out his alter-ego on stage for a wild and riveting performance. It is genuinely incredible. If you have ever been served a beer by this guy, I encourage you to check out the Long and Short of It. You will never know what hit you.